I think this might be my first official 4th grade post! 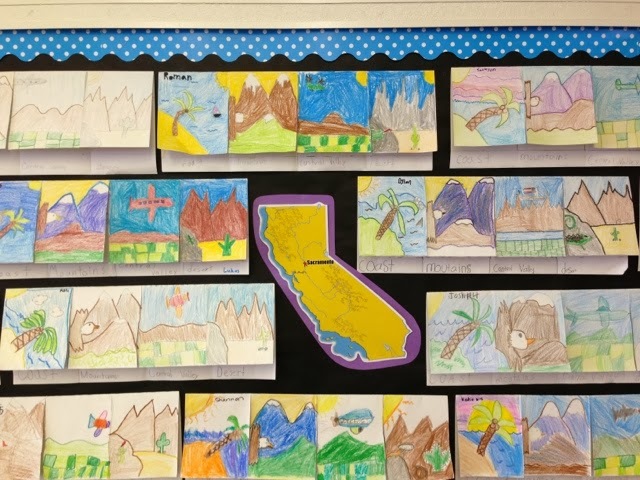 We are learning about the regions of California in our social studies curriculum. 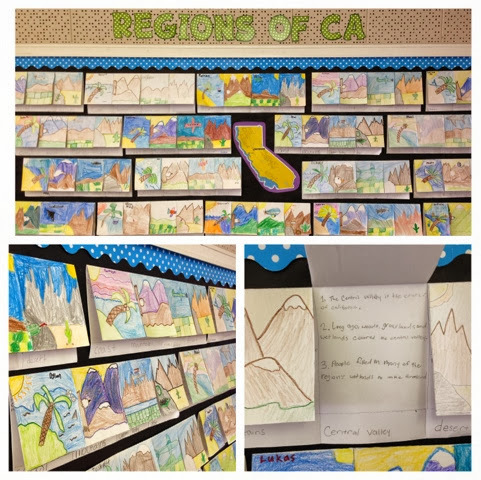 Lessons with Laughter had this brilliant idea of making a California regions foldable! I had the students make this regions response craft instead of answering the questions at the end of the chapter. 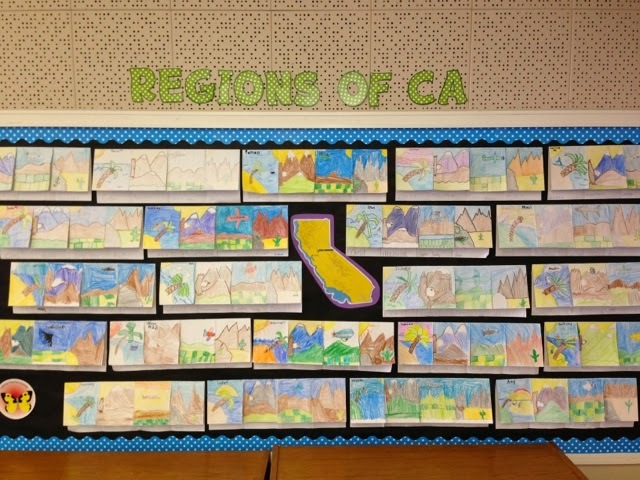 First, we did a directed drawing of each of the California regions. I drew each region on the board, and they copied me in pencil. We did the simple outline together, and then they went back and added detail and color after they finished their writing. 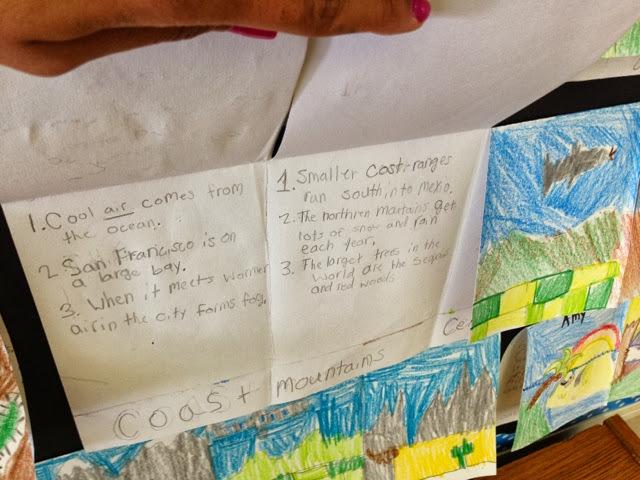 Their assignment was to read the chapter about the different regions in CA, and then they had to write 3-4 sentences about facts that they found. Three of the facts had to be from the chapter, and the 4th fact could be something that they already know about the regions. 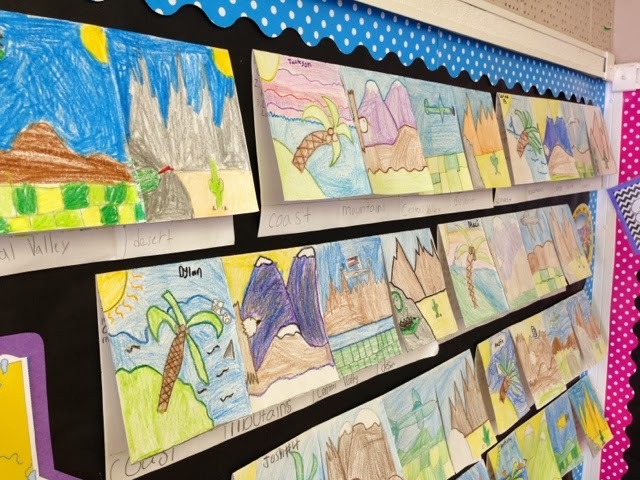 We made these the second week of school, and it turned into a great California history bulletin board for Back to school night. The kids response was, "Can we always do something fun like this in history?!" Thanks Molly for the amazing idea! Their response and the art projects turned out beautifully. This looks like so much more fun than answering the questions are the end of the chapter. Also, I forget how much more sophisticated their art is in 4th grade. Great idea. Thanks for sharing. You rock! That board looks great and is clear evidence of what they learned! Love it! Hi! This is my first time visiting your blog and I wanted to say that your kid's work looks amazing! It always amazes me how abilities with artwork changes from year to year (I've taught K-2 so their work isn't always as "pretty")! I'm impressed! Such a hands-on way to step away from traditional reports.